Somewhat magical, mostly undiscovered, La Slowteria is an oasis on the still tattered south end of Court Street. The Mexican restaurant derives its name from its style of cooking (slow) and the Mexican bingo game (Loteria), but what you really need to know is that the dishes emerging from chef Hugo Orozco’s petite kitchen — as well as the cocktails — are quite unlike anything you’ll find at most Mexican eateries. “People start calling us upscale or elevated Mexican, and I don’t think we are,” says Orozco of his menu, including the popular La Estrella, an appetizer of raw oysters paired with citrus slices and worm salt, and the El Negrito: duck in what the menu describes as a deconstructed black mole sauce with Mexican rice and pickled onions (delicious). “We are just a little bit more authentic,” Orozco says. There’s more than a touch of the tropics in the interior, much of it made from recycled wood and pallets, and featuring plenty of plants. The found decor is very much in evidence — a boot serves as one planter, there’s myriad tchotchkes tucked into corners, and references to the bingo game abound (including wooden boxes in which the check arrives). In season, the backyard — surprisingly cozy given its proximity to the BQE — is a found-object paradise. Orozco for some time operated a restaurant of the same name in Tulum, an eco-resort on the Yucatán Peninsula, which may explain La Slowteria’s myriad of fresh-squeezed juices, including a very nice limeade that adds just a touch of sweet to its tart. The chef says he wants people to understand that Mexico has much to offer past the ordinary fare, and its cuisine in truth is “very diverse,” Orozco says. Orozco, who was born in Mazatlán, isn’t afraid to experiment, and draws from his broad Mexican experience. 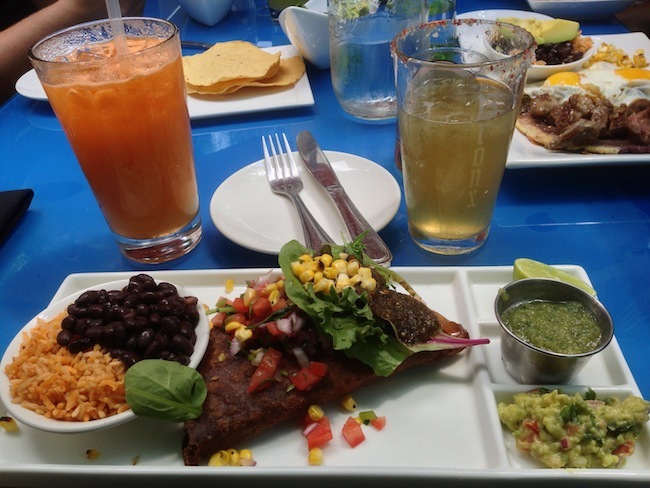 On the fall menu, for instance, are Mayan-influence dishes, a soup from Oaxaca, and touches here and there from Jalisco. As well, the chef focuses “on quality [over] quantity.” Every one of the toothsome tortillas is hand-pressed to order. The masa itself comes from Tortilleria Nixtamal in Queens, which Orozco says does a special blue corn version for his restaurant. No deliveries, no burritos. But there is a fantastic scallop ceviche. In fact, a particularly captivating Instagram photo of the ceviche drew me to the restaurant in the first place, back in August. Tulum’s loss is Brooklyn’s gain. I can’t think of a better place to start learning. Erin Behan is an editor at newyork.com, and has worked as a freelance food writer and editor in New York for 12 years, including a stint as a Senior Editor for Zagat.